Ten things to do with your kids on a SNOW DAY!!!! Snow days are really special in my house. The 5:43am cancelation phone call, the lazy wake ups, the excitement about staying home…and then 10 minutes later the complaining begins. “I’m bored” and “There’s nothing to do” pours out of my children’s mouths like water rushing down a steep hill. Soon, our special snow day becomes just another stressful day. If you have the same problem in your household, here’s some activities that are sure to keep your family entertained and happy. 1. Serve your kids breakfast in bed. The food can be as simple or intricate as you like. Oatmeal, cereal, pancakes, donuts…whatever your kids love the best. My plan was to make eggs, hash browns, fried ham, and biscuits, place them on serving trays, and surprise my sleeping boys. Well, I forgot my oldest son is an early riser, so he ended up waking me up. I told him to go back to his room and wait for a surprise. 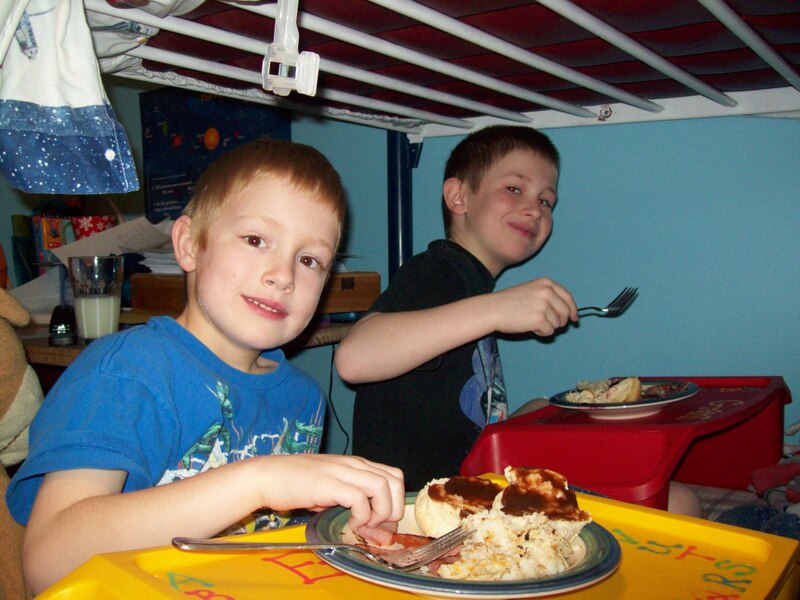 When my youngest woke up, he joined his brother in bed, so I ended up serving 2 breakfasts in 1 bed! As you can see, they really enjoyed this special treatment. 2. Play a board game. Dig the board games out of the closet and challenge your family to a game. One of our family favorites is Uno Roboto (my kids love that the robot makes funny sounds). Choose a few games that everyone loves and try to play for at least an hour. You’d be surprised how fast the time flies, and how much fun you have. 3. Watch a movie. Choose a family favorite and settle in (some of our favorites: Despicable Me, Get Along Gang, How to Train your Dragon, Never Ending Story). Let your kids drag out the pillows and blankets, or snuggle up in bed together. Make it extra special by serving big bowls of popcorn and hot chocolate with marshmallows. 4. Wear your PJs all day. Comfy PJs, cozy robes and slipper socks are a MUST on a snow day. 5. Make and play with playdough. My kids love to play with play dough, but I have found the store-bought kind tends to dry out. Here’s the recipe I have always used. Mix all of the ingredients together, and stir over low heat. The dough will begin to thicken until it resembles mashed potatoes. When the dough pulls away from the sides and clumps in the center, remove the pan from heat and allow the dough to cool enough to handle (it it’s still sticky, it needs to cook longer). Turn the dough out onto a clean counter or silicone mat, and knead vigorously until it becomes silky-smooth. Divide the dough into balls for coloring. Make a divot in the center of the ball, and drop some food coloring in. Close the top of the hole, trapping in the food coloring and place each ball in a sealed plastic bag. Then give the bags to your kids and let them mash and smoosh the playdough around until all the color is mixed in. 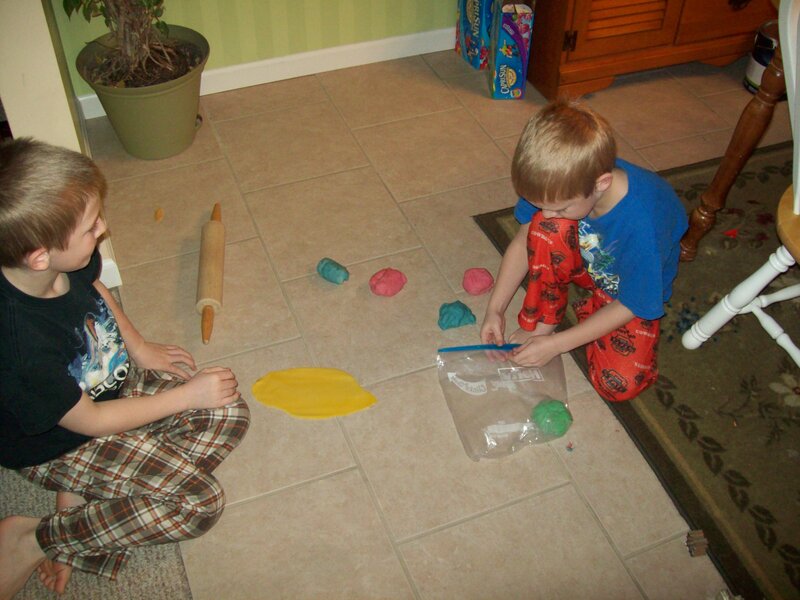 Store play dough in sealed plastic containers or bags. 6. Play outside together. Get everyone bundled up and head outside. Make snow angels or have a snowball fight. Take a hike in the woods. Catch falling snowflakes in your mouth. Just have fun playing with your kids. 7. Read a book as a family. Choose a book the whole family will enjoy. One of our favorite books, Little House in the Big Woods, is perfect for a snowy day. For more fun, after you have read the part about making maple syrup candy in the snow, let your family make their own. 2. The mixture is ready 6 to 7 minutes after it boils (220 to 234 degrees on a candy thermometer). It should stiffen when dripped onto a plate. 3. Remove from heat and cool for 2 minutes before pouring over the snow, ice cream, or ice. It cools so quickly that kids can taste it right away. 8. Nap. If your kids are quiet for a long period of time, they might fall asleep. To encourage napping, you can watch a movie or read in bed. Now, snuggle up next to your babies. Even if they don’t nap, snuggling with your kids is a great way to show your love for them. On the rare occasion I get to snuggle with my kids, I always whisper reasons I love them in their ear. My oldest usually beams and whispers sweet things right back, while my youngest just grins wickedly and whispers “I know”. 9. Draw on windows with markers.Your kids will have a blast! 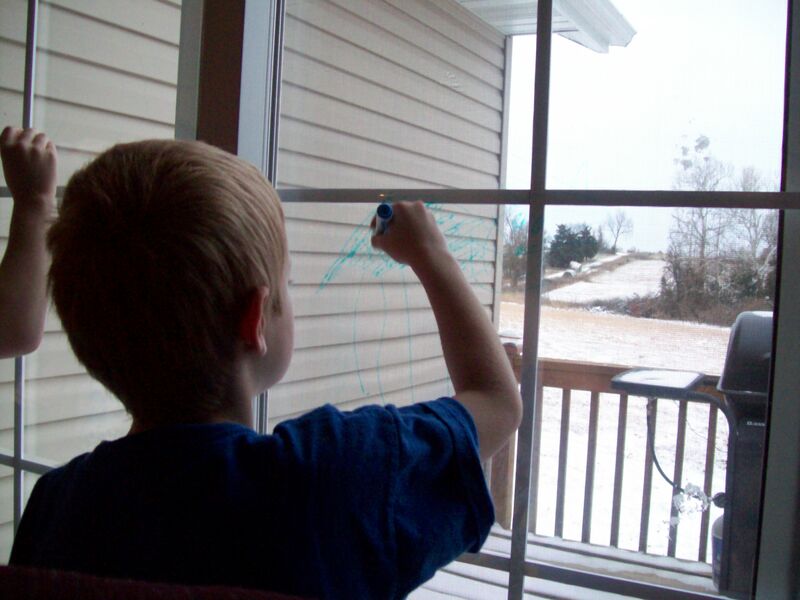 Make sure you use dry erase markers and have a big window (or sliding glass door) for them to decorate. Just wipe off with a dry rag. HINT: Make sure to set some coloring rules or you might find marker on your walls. 10. Cook dinner together. Pick out a recipe the whole family can make together. Tonight, my family will be making homemade pizza and I will let my boys make their own personal pizza. They stretch out the dough, then add the sauce, cheese, and toppings. My job is to cook the pizza. If dinner is not an option, make cookies instead. It’s so much fun to get your kids in the kitchen. Not only will they learn how to cook, but it also helps picky eaters, like my youngest, eat a broader range of foods. Hopefully, this have given you several ideas to help beat Snow Day boredom. Let me know what some of your favorite Snow Day activities are.